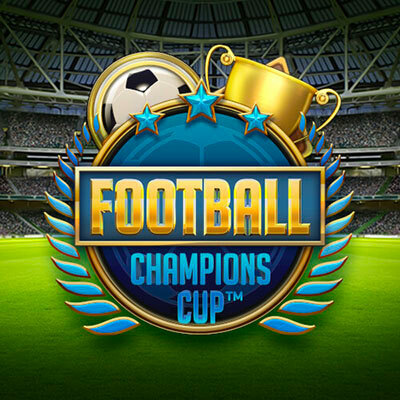 Football Champions Cup is an online slots game by developer NetEnt. The game is obviously football themed and delivers that exceptionally. From the symbols to the creative bonus rounds, it all ties in very well. Football Champions Cup has 5 reels, 20 pay lines. The slots game has a wide betting range with a minimum bet of £0.20 and the maximum bet of £100. Football Champions Cup delivers the mayhem and excitement of the World Cup with the perks of an online slots game. The symbols are football related: Gloves, Cup, Whistles, etc. and the bonus rounds are centred around football concepts like Penalties, Quarter Finals, etc. This bonus feature is modelled after the pick and click framework. It is triggered when players land 3 or more Bonus symbols. The feature consists of 5 rounds and within each round there are 2 components. Act as the player and pick from 1 of 4 positions to score a goal. Scoring a goal will increase the team’s score by 1 which equates to a cash prize. Act as the goalkeeper and pick from 1 of 4 positions to save the other team’s goal. If you manage to prevent the opposing team from scoring a goal, you will receive a multiplier. But if you do not manage to save the goal, the other team’s score will increase by 1. The Multiplier you receive directly correspond with the number of Bonus Symbols you received in the base game. The 2 components of the Penalty Shoot Out continues for 5 rounds, or until there is an emerging winner. The symbol with the Cup represents the Scatter in this online slots game. When 3 or more of these Scatters appear on the reels, the Free Spins Tournament is triggered! Each of these Free Spin Rounds is an individual football game. You only make it to the next ‘game’ (read Free Spin) if you win the match. There are 3 prizes up for grabs (1st, 2nd and 3rd). There are 4 Free Spin Categories: Last 16, Quarter Finals, Semi-Finals and Finals. Each of these categories consists of 6 Free Spins. During the Free Spins, Wilds & Scoring Wilds (Blue and Red) will award goals to either you or your opponent depending on where they appear. There are also prizes rewarded (1st, 2nd and 3rd) to the top 3 winning teams at the end of the rounds. Football Champions Cup is a great slots game for football lovers and slots enthusiasts. It cleverly brings in the enthusiasm of sports with the suspense of slots which is great fun. The Bonus Rounds are very creative and generous. There have been accounts of players winning up to 3,270 times their stake in this online slots game. So go on ahead, kick and roll away!